Melting sea ice has been shown to be a major cause of warming in the Arctic according to a University of Melbourne, Australia study. Findings published in Nature today reveal the rapid melting of sea ice has dramatically increased the levels of warming in the region in the last two decades. Lead author Dr James Screen of the School of Earth Sciences at the University of Melbourne says the increased Arctic warming was due to a positive feedback between sea ice melting and atmospheric warming. "The sea ice acts like a shiny lid on the Arctic Ocean. When it is heated, it reflects most of the incoming sunlight back into space. When the sea ice melts, more heat is absorbed by the water. The warmer water then heats the atmosphere above it. " "What we found is this feedback system has warmed the atmosphere at a faster rate than it would otherwise," he says. Using the latest observational data from the European Centre for Medium-Range Weather Forecasting, Dr Screen was able to uncover a distinctive pattern of warming, highly consistent with the loss of sea ice. "In the study, we investigated at what level in the atmosphere the warming was occurring. What stood out was how highly concentrated the warming was in the lower atmosphere than anywhere else. I was then able to make the link between the warming pattern and the melting of the sea ice." The findings question previous thought that warmer air transported from lower latitudes toward the pole, or changes in cloud cover, are the primary causes of enhanced Arctic warming. Dr Screen says prior to this latest data set being available there was a lot of contrasting information and inconclusive data. "This current data has provided a fuller picture of what is happening in the region," he says. Over the past 20 years the Arctic has experienced the fastest warming of any region on the planet. Researchers around the globe have been trying to find out why. Researchers say warming has been partly caused by increasing human greenhouse gas emissions. At the same time, the Arctic sea ice has been declining dramatically. In summer 2007 the Arctic had the lowest sea ice cover on record. Since then levels have recovered a little but the long-term trend is still one of decreasing ice. Professor Ian Simmonds, of the University's School of Earth Sciences and coauthor on the paper says the findings are significant. "It was previously thought that loss of sea ice could cause further warming. Now we have confirmation this is already happening." As of this month the arctic ice cover has returned to the '79 - '00 mean so this report is moot. deatopmq: Another example of how global warming deniers just don't understand what they're talking about. Old ice vs. new ice is one way to look at it. Ice albedo is just one more way. And you went for the simplistic 2D view. What does that say about your capabilities? It probably has more to do with increasing urbanization and deforestation of arctic areas as people move to the poles to avoid increasing tax rates elsewhere? Kidding of course, but I really am curious about the concentration of warming near the surface. What does that mean in regard to temperatures at other elevations? I seem to remember reading that it's difficult to get accurate temperature data anywhere but here at the surface. I don't think satelites can do it if I remember correctly. Balloons and aircraft are poor because of the limited sample rates possible, and rapid variation in speed and direction are another problem. I understand that they do the best they can with ground based observations because that's all they have, but they are only looking at a paper-thin slice of the total atmosphere. They seem to be making a lot of conclusions from very limited data. It's rare in science for serious researchers to make public conclusions without first gathering substantive data. @GSwift7: Google is your friend. I'm going to be nice and just point out that you're wrong about a lot of the science, and leave it at that. The Earth warms and the Earth cools. There is little man can do to alter that fact. One thousand years ago there were dairy farms in Greenland and Vineyards in Scotland. Today it is too cold. Christmas 1776 it was cold enough at Haarlem Heights New York that Washington ordered cannon dragged across. Today it is too warm. Yes, the Earth warms and the Earth cools. However, if humans add massive amounts of greenhouse gases to the atmosphere during a period when the Earth is naturally warming, it is going to enhance the warming. No one can say that the presence of humans on this planet has had little or no effect on natural processes without flying in the face of volumes of evidence to the contrary. It is a similar mentality that has led people to think things such as - we can never run out of fish, or we can never pollute the ocean because it is so large and human activity is so insignificant . . . Brains are ours to use, so let's use them! I think you mis-understood my question for a political statement about whether there is warming or not. The page you linked to clearly stated several times that only ground level observations are used. quote: "The current analysis uses surface air temperatures " That's one of the times they say it. I'm just wondering how accurate the models are. It could be even worse than they think, but I really don't think they know. Temperature gathering via satellite has been done since the 70's. New satellites are going up at incredible rates to watch weather patterns. Oh, I see you're stuck on the idea of trend vs. immediate temperature. Since you don't grasp such a basic idea, I'll just ignore you from now on, how's that GSwift7? ....One thousand years ago there were dairy farms in Greenland and Vineyards in Scotland. Today it is too cold. lol JayK, relax. I'm just saying we should spend more time and money on research because what we have isn't very good. The trend is obvious. I'm not arguing about it. I'm saying the predictions can't be very good because the models need a lot more information and information costs money. I'm just saying we should support more research and learn a few things from the experts. I'm sure the people doing the research would like more money to fund more extensive research. What I see commonly is a lack of general public knowledge about how difficult it is to estimate global temperature and therefore global temperature changes. If more people understood the difficulties then maybe governments would be willing to spend more money on good science. Why is that a photoshopped picture in the article? That is not a picture of the arctic. 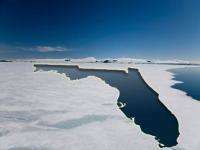 That is a blue picture of the coastline of FLORIDA superimposed on some snowy background. Or that is one VERY strange coincidence. Here's a link to a picture of the florida coastline. Draw your own conclusions. antialias: I have to agree that it certainly seems to be an image of Florida that has been tampered with. I have no idea why someone would put a picture like that in an article without an explanation. I assume it was meant as a joke, but it is not very funny in a scientific review. You would think that they would be more careful than that. Is the crack in the ice supposed to look like Florida? Shootist - you confuse weather and climate. You cannot extrapolate world climate from from the weather on specific days and locations. Global climate relates to average temperatures over years, weather is what happens today, tomorrow or last week. There are dairy farms today in iceland. Does that means that temps are warmer today than 1000 years ago? Of course not. Last winter had some of the coldest days in decades. So what? Single data points do not a trend make. deatopmg: as of this month? Northern winter is long gone, the ice will start to melt through northern summer. If it's only now getting back to the long-term mean, then something is very wrong. Ice advances and retreats with the seasons, so there is absolutely no reason to compare instantaneous measurements against a mean. If you were in my first year uni physics labs, I'd take off 2 marks for that. 2. They put Florida there to show the size - unfortunately, if the size were that large, you would see more curvature on the horizon.